On the weekend that saw Jordan Henderson’s stunner help Liverpool overcome Chelsea, Arsenal convincingly beat Hull and Pep Guardiola’s blue moon rise even higher, Manchester United dropped points at Vicarage Road, providing a disarray display to the travelling supporters. Venturing into the season, hope had been restored. Manchester United’s summer business was nothing short of astonishing in the players they signed without Champions League football and for the first time since Sir Alex Ferguson’s retirement, the man in control of the eleven that graced the Old Trafford turf was a recent winner. Five games in, three wins, two losses. One of those to the noisy neighbours whose tactical rejuvenation under Pep Guardiola is gathering momentum at a supersonic pace. There are underlying issues within the Manchester United team, those that are yet to be answered. The Wayne Rooney debate – case closed. Being one of Wayne Rooney’s biggest supporters in recent times, I’ve run out of reasons as to why he should start. First, it’s his ‘leadership qualities’, well where are they? The most successful captains have been the likes of Carlos Puyol, Steven Gerrard, Frank Lampard and even at United, Roy Keane. These are players who set examples, who players want to impress and considering all ten other players on the pitch usually out-perform Rooney, who do they have to impress? Steven Gerrard, Mr. Liverpool, Frank Lampard, the complete midfielder who epitomised Chelsea, every game, at least a 7 or 8 out of ten, Wayne Rooney? He’s lucky to get a 6/10 in some games. The 30-year-old seems more bothered about arguing with the referee, than his and his team’s performances. Ander Herrera, both against Manchester City and Feyenoord, gave Manchester United a spark, the difference being, Wayne Rooney’s the shadow over any light in the Manchester United team. The system. Sir Alex Ferguson’s Manchester United was built on explosive counter-attacks with direct forward players, but since the dismantlement of the teams Ferguson built, Manchester United haven’t adopted a system that can be recognised and feared. Today, each player looked like they’d turned up and not spoken with Jose Mourinho once, clueless as to what their role was, whether to press or sit off, United’s players seemed to be caught in two minds, exactly how they were in the Manchester Derby. 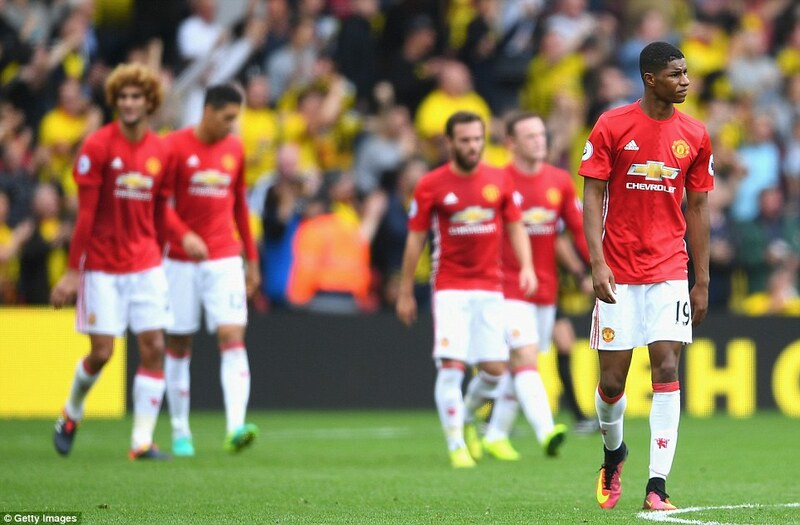 The presence of Louis van Gaal looked to be looming within the players who played under him, the boring, easy football was a choice players had made, instead of taking risks in order to push Watford back. Watching at home, at Vicarage Road or on the moon, there wasn’t a game-plan or system in sight as lacklustre passes and awareness became one of the downfalls Mourinho’s men made against the Hornets. With organisation said to be one of Mourinho’s biggest assets, it was Manchester United’s contributing factor to a self-made loss today. On both goals, the goal-scorer could have taken two or three touches before he placed the ball past David De Gea. Wayne Rooney, Paul Pogba, and Marouane Fellaini started in a midfield three, but whether they actually played in midfield was another question. All three failed to pick-up men on numerous occasions, and Manchester United had been let off the hook multiple times before being punished. In Watford’s first goal, Fellaini is drawn into Ighalo, despite Bailly being goal-side of the Nigerian forward, leaving an unbelievable amount of space for Capoue, who capitalised on that and put Watford in front in 33-minutes. United played with a three-man midfield, and not one of Rooney, Fellaini or Pogba are anywhere close to Capoue, meaning schoolboy defending cost Mourinho to go behind in the first half. If that wasn’t bad enough, Watford went ahead with eight minutes to go, with an almost identical goal, this time, Zuniga finds himself in yards of space. Fellaini is covering Chris Smalling and Luke Shaw, whilst the left-back stands on his laurels instead of covering Fellaini, whose man fires home. Again, neither Rooney, Pogba or Fellaini pick up Zuniga as both Fellaini and Pogba are drawn into the ball. The lack of communication was another huge factor within the squad, highlighted when Odion Ighalo’s shocking miss saved Chris Smalling and De Gea from complete embarrassment as they collided on the edge of the box. In all honesty, watching Manchester United today was like watching eleven school boys who hadn’t met before. In the world of statistics, Paul Pogba will be regarded as irrelevant today, and of course, effort isn’t always rewarded with points, but the Frenchman was the only person, bar Rashford, trying to make something happen. The expectation that falls on someone’s shoulders who cost £89m is as excessive as it is correct, but even the world’s most expensive player cannot create miracles when the other nine outfield players perform like they might as well be watching it from the comfort of their homes. Since the Derby, Manchester United fans have been asking to see Pogba in a three-man midfield, hoping to see the 23-year-old replicate his form at the Bianconeri, but his midfield partners of Wayne Rooney and Fellaini didn’t compliment him at all. Wayne Rooney’s forward instincts meant he was often caught in the opposition’s half when Watford regained possession, and as Fellaini dropped into centre-back, Pogba was left isolated and exposed in a 3 v 1 midfield. The solution to this problem lies within the club already, Michael Carrick. The 35-year-old has lost his mobility as he ages, meaning he sits in front of the defence, allowing Pogba to venture forward without being caught out. Pogba was guided in Juventus’s midfield by Andrea Pirlo and arguably Marchisio, but within the Manchester United midfield, there lacks an experienced midfielder, who can control where Pogba goes and dictates the tempo of the game, two things which either Bastian Schweinsteiger or Michael Carrick can do, meaning it’s a question of Mourinho’s stubborn attitude and whether he’s willing to give the midfield veterans a chance to prove themselves.